A U.S. Federal Trade Commission study has found that the videogame industry's compliance with age ratings continues to lead the pack. It's not "new" in the sense that this is something the FTC has been saying since 2008, but it will probably come as news to a lot of people who don't keep up with such things and simply assume that the videogame industry is the Great Satan, peddling filth to small children to pad its profit margins. The truth, however, is that the videogame industry continues to enjoy a higher rate of compliance with age ratings than any other entertainment industry. In a "mystery shopper" program conducted between April and June of 2012, only 13 percent of unaccompanied shoppers aged 13 to 16 were able to buy M-rated videogames; that rate has held steady from 2010 but is still well ahead of the second-place finisher, the movie industry, which refused 24 percent of underage customers who attempted to buy a ticket for an R-rated film. Individual retailer ratings were generally quite solid, with the exception of Walmart, which allowed 25 percent of underage customers to purchase M-rated games; but GameStop, Kmart and Toys R Us all managed compliance ratings of 90 percent or better, and Target managed an unprecedented 100 percent rate of compliance. That mark is even more impressive, at least from a gamer's standpoint, in light of the fact that Target's performance in all other categories is mediocre at best, although it nonetheless showed significant improvement across the board. 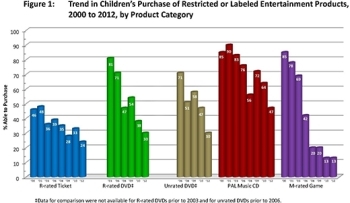 The 2012 FTC study found that 30 percent of underage shoppers were able to purchase unrated or R-rated DVDs, and 47 percent were allowed to purchase music CDs with Parental Advisory Labels. Despite lagging well behind the videogame industry (and some wonkiness in the R-rated movie ticket category), the study revealed a significant improvement in age rating compliance among all entertainment industries. The numbers also lend credence to ESRB President Patricia Vance's warning last month that awareness and use of videogame age ratings may have peaked.